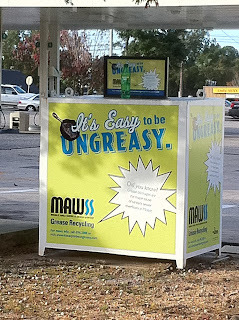 Since fried food is so deliciously prevalent here in Alabama, there are now Grease Recycling Centers. ….although I wish it was. FYI: I was too scared to open this box to see the “containers”. Does your city have these? Or is Paula Deen and the Colonel just taking over the South? And remember kids, "Its Easy to be Ungreasy"! I was driving away from a client's house when I noticed smoke rising up above her home! I immediately called the client to tell her, and in response she calmly stated, "Thank you." A few days later I went to her house and I couldn't help but ask about the fire. Surely it was a huge, dangerous fire that I notified her about that day! I was relieved everything was ok, but I couldn't wait to get the details! 1. If you have a whole bunch of leaves and brush from your yard because you just cut a bunch down, you can burn em. 2. 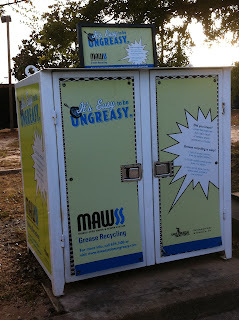 If you don't have trash service where you live, you can burn em. 3. Bringing trash to the dump requires a truck and a hefty fee. So if you are cheap/unable to afford it, you can burn em. He then added, "I know people that burn everything, but my parents just burn brush and limbs. Makes for a good bonfire. One day we'll take you to Albertville and we can show you both." I can't wait for my tour of burn piles in David's hometown. Contact me if you are interested. I'll bring the marshmallows. I started listening to country music in high school back in South Florida. It wasn’t the norm, but I really liked it. I loved the stories within the music. 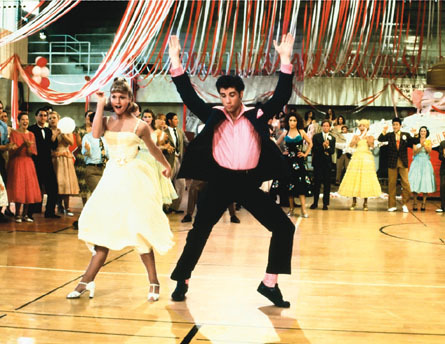 It wasn’t all about gettin’ crunk on the dance floor. Don’t get me wrong, I loved, and still love, pop music (and I may or may not be known to bust out into a gangsta rap song), but country music talked about normal people’s lives and I could relate to it. However, there was a lot that I could not relate to - like grits and greens, red dirt roads, and I had no idea what a Roll Tide was. 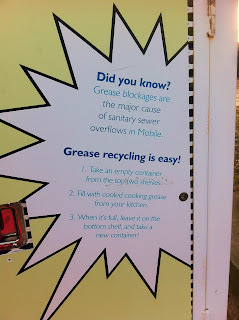 Well it’s been less than a year and I have to admit, I have tried greens, I actually like grits, I know that Roll Tide is a common phrase for greeting and departure, and there are parts of my car that are stained orange from red dirt roads. You know those yellow road signs that say “___ crossing”? (or “XING”, which when I read in my head, I like to pronounce “zing”. It’s a lot more fun that way.) I’m talking about the school-crossing signs, the Railroad Xing signs, the occasional Deer Xing. No big deal, right? Yeah, that’s right, TRACTOR Xing! WHAT IS THIS?! This is not a tractor, my friends. This is like the T-Rex of tractors! I’m sorry, but the Tractor Xing sign is deceiving. This is not the same little tractor displayed on that sign. I literally had to pull over to let this monster through, and he even has one tire on the grass! Whatever it is, it was awesome. Well, I officially moved to Alabama from South Florida. (Quite the change!) So, to share my new adventures in "The South" with my friends and family (all of which have never been to Alabama), I bring you to my blog.